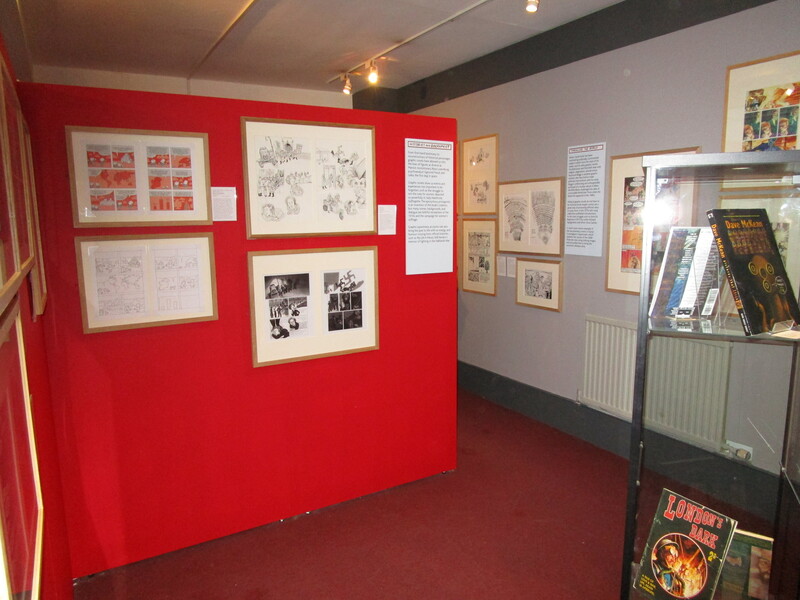 You know this by now, but I’ll tell you anyway: last Wednesday the exhibition I have been curating with the Cartoon Museum opened to the public. It runs until 24 July 2016, so you have plenty time to visit. With over 125 pages of original art on display there should be something for everyone’s tastes. That’s been a major part of our thinking as we’ve organised the exhibition, to give visitors a little of what they know already and a little of what they’ve never seen before. Where to begin, where to begin. How about what you’ll find in the exhibition? For starters, original art from a swathe of canonical British graphic novels. To throw a handful of titles out: Gemma Bovery, Tamara Drewe, Watchmen, V for Vendetta, The Sandman, Alice in Sunderland, From Hell, and Arkham Asylum. You would expect nothing less from an exhibition with ‘Great British’ and ‘Graphic Novels’ in the name. But I am quietly confident that there will also be comics you didn’t expect to see. Lots of them. Reflecting my own research, we’ve been excavating some prime texts from the 1970s and early 1980s. A few of these have been hidden in the public eye: when Posy Simmonds’s True Love and Ken Pyne’s The Relationship were released in 1981 they were published by major presses and reviewed in the national media. Still, most 1970s graphic novels were by underground creators, artists such as Bryan Talbot, Angus McKie, and Chris Welch who made their names in the feisty world of comix (with an ‘x’). Underground comix featured frank sexual material, left-wing politics, and psychedelic imagery. All of these characteristics made their way into the 1970s graphic novels and I’ve mentioned some of the books on display (Introduction to Chile, The Jewel in the Skull) in this blog before. We’ve gone back even earlier in the opening section of the exhibition. This gallery, called ‘Roots and Traditions,’ thinks about how the contemporary graphic novel sits at a confluence of artistic currents. We’ve underlined this with a selection of relevant illustrators, painters, and cartoonists that have influenced the development of (i) long comics narratives, (ii) comics for adults, and (iii) publishing comics in book form (sometimes, but not always, all three at once). It’s hard to understate the importance of William Hogarth, who used sequences of engravings to narrate tales of immorality and instruction. As a print from the first of these sequences (1732’s A Harlot’s Progress) demonstrates, it may not be meaningful to say ‘Hogarth was the first British graphic novelist’ but he is historically important for appealing to a large adult audience with his sequential art. ‘Roots and Traditions’ not only shows significant signposts pointing to the contemporary graphic novel, it reveals the ongoing dialogue between past and present. Eddie Campbell’s Bacchus is a great example. In the 1980s and 1990s Campbell drew the present-day exploits of the Greek god Bacchus, who retold myths, got entangled with the mafia, and became the sovereign of a pub that seceded from the United Kingdom. Bacchus, the god of wine and revelry, was an ideal foil for Campbell to revisit the history of engraving and print-making because so many major illustrators over the years have depicted the dangers (and pleasures) of alcohol consumption. Bacchus’s arch-nemesis was Mr Dry, an advocate of abstinence based on a character from Prohibition-era political cartoons, and in one scene Mr Dry chases Bacchus through a series of classic prints, starting with Hogarth’s Beer Street (1751). If you’re wondering about all those 1980s and 1990s graphic novels I haven’t mentioned, you’re right, there’s a lot more to the exhibition. For anyone (like myself) who thinks serious scholarly attention needs to be devoted to the UK’s small press / self-publishing scene, you’ll enjoy seeing art by Gary Spencer Millidge (Strangehaven), Nabiel Kanan (Exit) and Dave Hine (Strange Embrace). Some of the work on display comes from creators with roots in that milieu but who have gone on to write and draw graphic novels for book trade publishers, like 2013’s Montague Terrace by the Pleece brothers. Beginning in the late 1980s Deadline magazine offered a home to a group of lively creators plugged into trends in fashion, design, and popular music. The Great British Graphic Novel has several pieces of Jamie Hewlett art featuring the character Tank Girl as well as graphic novels that Deadline artists like Nick Abadzis, Rachael Ball, Ilya, and Philip Bond have worked on since the days of the magazine. The idea here is not to list everything in the show, but to pique your interest. Let me pause there and return with some photos and a tube map. This entry was posted in Uncategorized on 23rd Apr, 2016 by Paul Gerald Williams.